Annapolis Micro Systems Introduces Two New High-Performance Mezzanine Cards for Signal Processing - Annapolis Micro Systems, Inc.
Annapolis Micro Systems, a leading FPGA board and systems supplier, announced today the debut of two new high-performance Mezzanine Cards for use in high-end data acquisition, processing and storage. Both new daughter cards boast superior density and analog performance, and are optimized for use with Annapolis’ world-class WILDSTAR FPGA Boards and WILD40 EcoSystem for OpenVPX and PCIe. Annapolis boards employ the latest Xilinx UltraScale(+) and Intel Altera Arria 10 & Stratix 10 FPGAs. 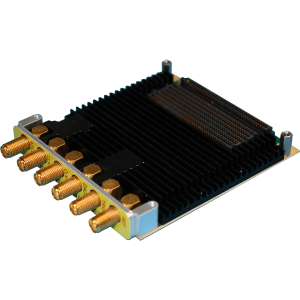 The single-channel 5.0GSps 10-Bit ADC 12-Bit DAC WFMC+ Card was specially architected for latency-sensitive applications where every nanosecond counts, as with Digital Radio Frequency Memory (DRFM) devices in sophisticated Electronic Warfare (EW) systems. It features Analog-to-Digital Conversion (ADC) of 10 bits and Digital-to-Analog Conversion (DAC) of 12 bits, running at a sample rate of 400-5,000MSps. This rugged card’s ultra-low latency is unequaled in the COTS marketplace. ADC SMA input to DAC SMA output is under 15ns in digital bypass mode, and under 23ns in fabric space mode. The Board Support Interface, which is available for VHDL or Open Project Builder™, includes a built-in bypass delay which can be from 0 to 124 ADC sample clock periods. This allows the user to “walk” the latency out from the minimum digital bypass mode latency to slightly beyond the fabric space latency, providing for a smooth transition between the two modes. The second new mezzanine card – KSII DSP WFMC+ Card – features a Texas Instruments KeyStone II ARM/DSP. The Keystone II includes Quad Cortex-A15 processors running at 1400 MHz and eight C66x DSP Cores running at 1200 MHz. Depending on the application, this rugged card has a few potential advantages: lower power consumption and cost, a close coupling with processing FPGA, and faster time to market. Both mezzanine cards feature Annapolis’ WILD™ FMC+ (WFMC+™) next generation I/O site. WFMC+ is compatible with the FMC/FMC+ specification, but outperforms it. WFMC+ supports 32 HSS and 100 LVDS as opposed to only 24 HSS and 80 LVDS for FMC+. This provides the ability to support higher density ADC and DAC solutions, as well as mezzanine card stacking.